I'm kicking off a brand new series called Style Talk, where I interview stylists and stylish women and convince them to share their secrets with me, and with all of you! Today's interview is with Stella Compiseno of The Heart's Delight. Stella is a stylist and a blogger, and I was particularly drawn to her because we share similar career backgrounds in finance. I'm fascinated by women who have successful careers in finance and capital markets, and move on to completely different roles - there are a number of fashion businesses today whose female owners have these backgrounds, and Stella's jump to a new career is both interesting and inspiring. 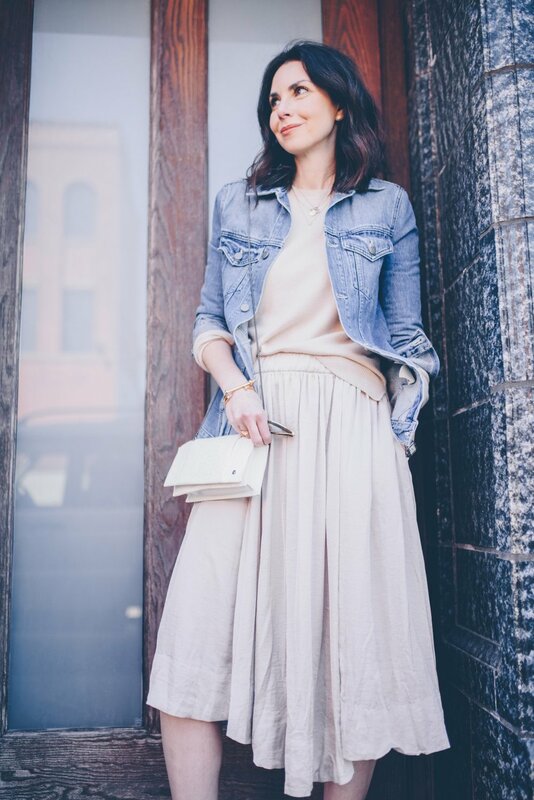 A huge thanks to Stella for her time and for sharing her story and style tips on the blog! How + why did you become a stylist? For a long time (12 years) I was probably the furthest thing from a stylist! I worked on an Institutional Equity trading desk in sales. While my career in Capital Markets and finance fulfilled the analytical and practical side of my personality, I was always reaching for outlets to explore my creative side. Fashion, design and styling was always a passion and inspiring to me, ever since I was a kid. While I had never made a career out of it, I actively pursued it in my free time -- helping people find special outfits, organize closets, style a party, etc. It was just always something I did for friends and family, but never made a business out of it. When I moved to Cleveland in 2011, I finally had a chance to take the plunge and re-discover my heart's delight. Since I couldn't transfer my old job to my new city, I created my own business opportunity, focusing on my styling pursuits and fashion/lifestyle website, The Heart's Delight. I've now been styling professionally for over 6 years. My style has definitely grown and evolved as I've gotten older. In my 20's I was all about trend driven fashion. I loved all of the fun, bright styles and colors and wasn't timid about my fashion choices. I lived in NYC and had access to some of the newest and coolest designers just outside my door. As my life transitioned from single, NYC girl to suburban mother of 2, I've matured in many ways -- including my style! I'm less drawn to trends and more focused on building a sophisticated, classic and easy wardrobe that makes me look and feel great, without much effort. My style mantra is all about fewer, better things. I want to LOVE whatever I pull out of my closet and be truly happy to wear it for years to come. We’ve all made style faux pas in our lives - Please tell us about an outfit you wore in the past that makes you cringe when you think of it today. Oh, geez... the late 90's were a rough phase for me. I just cringe thinking about all of those terrible clunky shoes I wore that made me look like Frankenstein. I'd wear these tight, black, bootcut pants, with a "going out top" and the horrendous Steve Madden elastic platform sandals that would "thwwaaap" with every step I took. SO BAD. I'd probably sternly tell myself that while trends can be fun and look great, they don't work for everyone all of the time. Pick and choose only those trends that work for your own aesthetic, lifestyle and body. I might have saved myself the trauma of growing out a ill-advised pixie hair cut. I follow an 80-20 rule for my own closet. I build my wardrobe using 80% classic, timeless pieces and 20% trend driven items. I invest in my classics and save on my trends. I realized a long time ago, that while spending $500 on a pair of shoes might sound crazy to some people, I wear those shoes for YEARS and they make me feel amazing each time I put them on. That's worth every penny. I've also created a signature style for myself which is clean, neutral, modern and minimalist. This has helped me stay true to my own aesthetic and ensure that every piece I purchase will be seamlessly incorporated into my daily wardrobe and not stand out like a sore thumb. If I can't think of 3 different ways to wear a piece, I don't buy it. Everything in my closet mixes and matches and gives me tons of options no matter what the occasion. Oh, gosh... I love this question! 1) An IRO single button black blazer -- the ideal topper for any occasion or outfit that makes you look instantly put together. 2) A VERONICA BEARD ruched mini dress -- it's SO beyond flattering and the dash of feminine my sometimes tomboy-ish wardrobe needs. 3) A CELINE leather satchel -- the caramel color is just so versatile and the leather is buttery soft. 1) High waist paperbag pants -- a great summer alternative to jeans and super flattering to highlight a waistline! 2) Round Straw crossbody bag -- inexpensive and makes a visual impact. 3) Statement earrings -- modern geometric metal and/or acrylic earrings are an inexpensive way to give the most basic summer outfits (tank + jean shorts) and major style boost. I honestly have a few, but the one that I use with EVERY woman (and the occasional man) I style is give your sleeves a roll and cuff your jeans! It's amazing what a little roll can do to change proportions and make an outfit feel more finished, flattering and styled. What are some style blogs your follow? Damsel in Dior: I love Jacey's minimal vibe and her ability to take a trend and own it, making it her own. Her personality and Instagram Stories are also beyond entertaining and worthy of a follow. Happily Grey: Mary is simply stunning, but her style is what keeps me coming back. 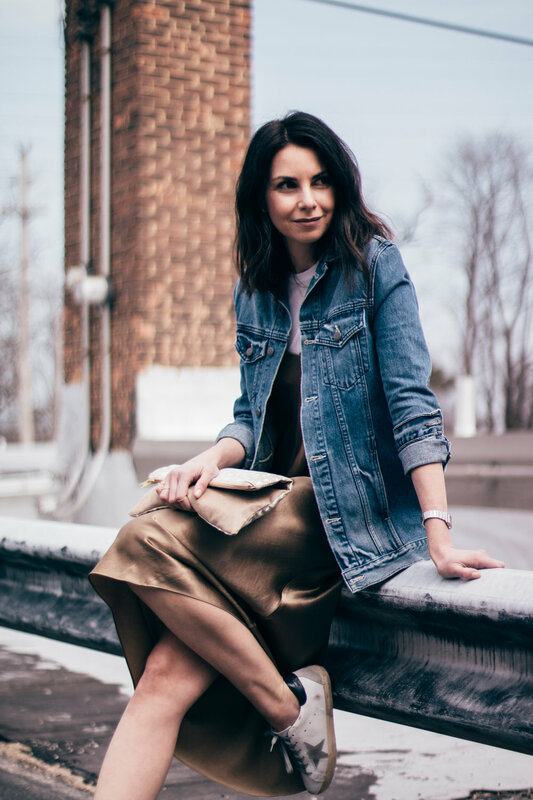 I love the way she mixes and matches -- dresses + combat boots, distressed denim and silky camisoles, flirty skirts + sneakers... she has a gift and an eye for good style. Atlantic-Pacific: While I could never pull off Blair's editorial style, her images and styling are impeccable and truly inspirational. Find more of Stella at her website www.theheartsdlite.com or over on Instagram!